The stop in Philadelphia was special because Sølvguttene had hosted the Keystone boys on their tour of Norway in 2012. “We were able to reciprocate their hospitality, ” said Keystone Music Director Steve Fisher. “This was a special stop because we were reuniting with them, ” said Fredrik Otterstad, Music Director of Sølvguttene. While they performed together a few times during the week of September 28, the last two concerts were co-sponsored by Norwegian American Chamber of Commerce Philadelphia, and were part of GlobalPhilly™ 2015, two months of multi-cultural events highlighting the diversity and global impact of Philadelphia. The festival is presented by Global Philadelphia Association and its members, including NACC Philadelphia. 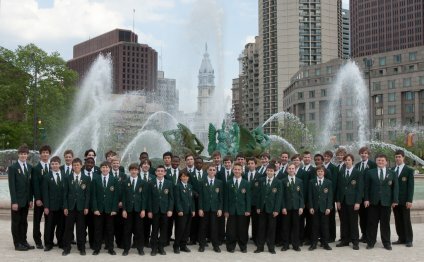 “Sølvguttene is Norway’s most famous boy choir and [NAAC Philly is] thrilled to have them here in Philadelphia, ” said Frode Kjersem, President of NACC Philadelphia. The crowning event, on Oct. 1, was performed in the Abington Presbyterian Church sanctuary in suburban Philadelphia in front of around 325 people, who were treated to a tremendous, inspirational performance. Some songs were sung together, some just by Sølvguttene. The age range ran from young boys to one Norwegian man who has been in Sølvguttene for 63 years. There was humor in some selections and the pure enjoyment of singing by both choirs was evident. Over the last 10 years, Sølvguttene has visited Italy, the Baltics, United Kingdom, Greece, Germany, South Africa, and Turkey. Besides Norway, Keystone’s travels have taken them to Antarctica, Brazil, Vietnam, Malaysia, Alaska, Canada, South Africa, Japan, Thailand, Cambodia, Australia, Monaco, France, Germany, Austria, Bulgaria, England, India, New Zealand, and Tasmania. “I love to sing, ” said Sølvguttene’s Scott Adde, 13, who’s been a member for four years. “I sing every day, all the time, wearing my headsets.” His 17-year old brother, Edward, is also a member. Fellow 13-year olds, Karl August and Kaspian Nilsen have been singing with the choir for 6 and a half years. The longevity is similar among the Keystone boys. Keystone visited Norway at a remarkable time and participated in two moving serendipitous events. They sang at the cathedral in Tromsø on the first anniversary of the massacre at Utøya. A family whose son was killed in the attack was at the concert. In Oslo, they were in a town square when Aung San Suu Kyi received the Nobel Peace Prize she’d originally won in 1991 while under house arrest in Myanmar. Sølvguttene was asked to sing. If the Norwegians had come a few days earlier last week, they could have joined Keystone when they sang for Pope Francis. “When we were in Norway, the boys talked about being the choir that sang in the northernmost city, northernmost church, the northernmost 7/11—or Norway’s version—the northernmost McDonald’s, but there was no northern McDonalds, ” said Fisher. The two choirs opened the Abington concert with a rendition of “Draw the Circle Wide, ” which Fisher explained is a great gathering song with a strong message. Approximately 70 members of the two choirs crowded the front of the altar. Colin Kohne of Keystone and Alexander Reed of Sølvguttene sang a duet. There were around 125 combined members of the two choirs. Later, Otterstad noted, “We know boys’ voices change at the age of 14, but it can be retrained, so here is our ‘youth group.’” Ten teens sang “I Love Coffee, I Love Tea, ” Billy Joel’s “For the Longest Time, ” and an Irish song, acapella, with flair and humor.